Under British rule in 1735, the trial and imprisonment of publisher John Peter Zenger, who was arrested for publishing libelous articles against the British royal governor. He was acquitted on the grounds that what he published could not be proven false, thereby establishing a precedent for freedom of the press. The Stamp Act Congress in 1765 with nine of the colonies’ delegates protesting the tax on paper products, playing cards and dice They produced a list of colonial rights and grievances to King George III and Parliament. The Stamp Act was repealed in 1766. Congress under the Articles of Confederation met here from 1785 to 1789. 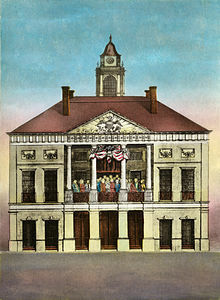 The first Congress under the Constitution met here in March 1789. George Washington was inaugurated April 30, 1789, where the statue stands today. The First Congress proposed twelve amendments to the Constitution in September 1789. Ten were ratified in Philadelphia and become known as the Bill of Rights. In September 1789, the First Congress established the Judiciary Act of 1789, creating the federal court system including the Supreme Court with six justices, one Chief Justice and five Associate Justices.